Learn to dance the sizzling hot Salsa, a beautiful Latin American dance filled with lots of fun turns and tricks! Like many Latin American dances, the Salsa is closely related to the Mambo which originated in Cuba. An important characteristic of Latin dancing, called Cuban Motion," will be emphasized. Cha-cha is a lively, fun and playful dance It became a dance craze in the 1950's and is not only danced to Latin rhythms - it is also great for rock and roll tunes! The Rumba is slow, sensual, and danced to music featuring a romantic feel and languorous beat. You'll be introduced to a variety of Latin music, as well as many beautiful American love songs that are perfect rhythms for Rumba. You will be provided a music and dance step list that will help you practice at home. Bring a friend or meet new friends! We rotate partners, increasing your dancing ability by 70%! But if this is your date night, please feel free to stay with your partner. Please wear comfortable shoes, no sneakers or flip-flops. No partner necessary! 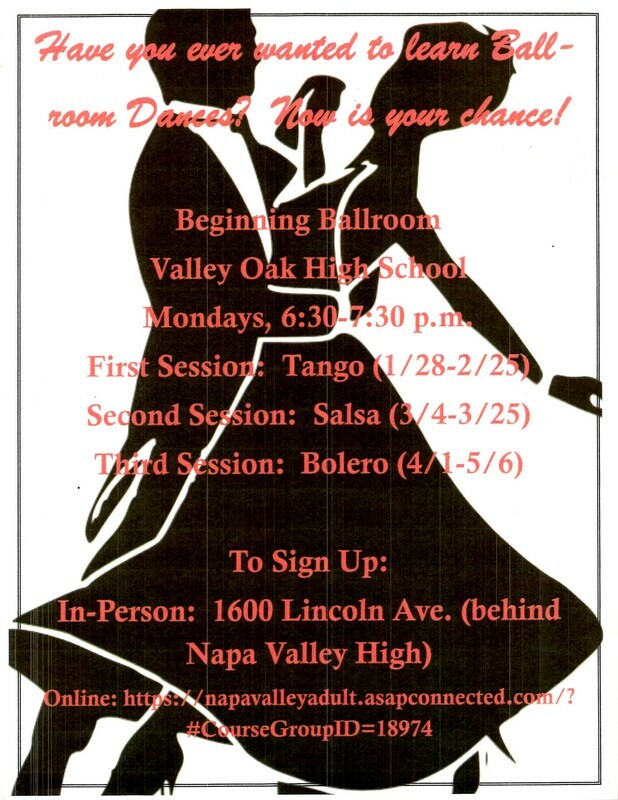 Please feel free to call the instructor for questions or more info: Susan Gai (707) 255-2994. Pre-registration is required (this is important in order for instructor to acquire assistants to ensure an even class ratio). ​Same shopping center as the Rayley's super market.